What have the generous folk in Scotland done? Quite simply, in terms of peaceful civil rights movements, they have produced a “game changer” which will go on to have a profound effect on the future of the already powerful global Boycott, Divestment and Sanctions (BDS) campaign. Thousands of ordinary Celtic fans picked up and waved Palestinian flags at their Celtic Park Stadium during a match against an Israeli team, as reported here in MEMO; the flag-waving demonstration flew in the face of police advice. This simple but powerful act of mass defiance created a storm of media attention across the Middle East, which has now propelled Celtic alongside the likes of Real Madrid, Barcelona and Manchester United in terms of stature and popularity in the region. Football’s European governing body, UEFA, warned that it would fine Celtic for its fans actions, but the fans retorted that they would match any fine imposed on the club, pound for pound, in donations to Palestinian causes. True to their word, the Green Brigade has raised nearly £100,000 in a crowdfunding appeal for Palestinian charities; the total continues to rise. Napier pointed out that the primary task of protesting through BDS is to send a message to the beleaguered people of Palestine that they’re not alone. “You can put up with being in a prison if you know there’s real solidarity out there for you. 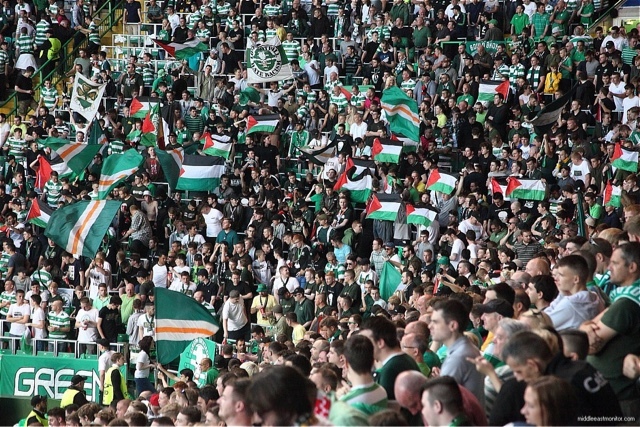 This gesture from Celtic Park also shows Palestinians that there’s a huge gulf between our rulers and the ordinary people.” The actions of the Celtic fans, he added, will encourage and give support to the BDS movement at a time when supporters of Israel are trying to criminalise the entirely peaceful campaign. The generosity and solidarity of Glasgow Celtic fans is a game changer indeed.